Junk and Rubbish Removal Services in Maine. At 1844-Junk-Rat – junk and rubbish removal in Maine is made easy… because we do all of the work! The goal of the Maine branch of 1844-Junk-Rat.com is to surpass your expectations when dealing with our junk removal project. We are certain of your satisfaction thanks to the affordable, yet competitive rates offered in basement cleanouts, construction debris removal, commercial junk removal, yard clean ups, relocation junk removal and so much more. Being a company that is sensitive about the environment, we make sure to recycle all applicable materials and donate locally any items that are still functional. 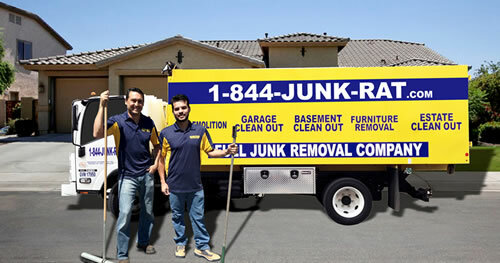 Scheduling with 1844-Junk-Rat.com is easy since we offer both urgent and weekend pick-up services. To reduce the stress of junk removal, our team handles all lifting, sorting and loading so you can spend your time doing something more productive. We clean up after every job, so your peace of mind is assured. If you are ready to get your junk removal project off the ground, give our offices a call today. My husband and I wanted to extend our kitchen area and build a deck off the rear of our home. While planning, shopping and organizing we never thought about how we were going to go about breaking down the walls of our home without creating more work for ourselves. After a bit of research online regarding demo teams in the Auburn area, we ran across 1-844-JUNK-RAT.com. The great thing about the company is not only do they offer demolition services, but they also offer recycling for all of the materials that result from the demolition. The company was able to come out in a short time to give us a fair estimate of the time and cost involved in the project without pressuring us to make a choice on the spot. We did choose their services and was very pleased at the professionalism and dedication they put into our demolition project.